“We get hard fans.” That was how Jerry Garcia explained the band’s steadily burgeoning appeal to a young New York Times rock critic in 1969. “Once we play the same place three or four times we know we have a core of fans that’ll stay with us no matter what we do.” It was a prescient comment, typical of Garcia’s affable but keen insights--and also spot-on: Over the next 26 years, dozens of venues around the country would become hallowed ground to Dead Heads because of the legendary performances the band played in these places. That year marked the Dead’s first full-fledged tour of American colleges and universities, and over time, campuses would become incubators for Dead Head culture in ways that commentators have yet to fully explore. The way the band took root in America’s institutions of higher learning is a critical part of the story of the Dead, one that this release helps document. And what a document. 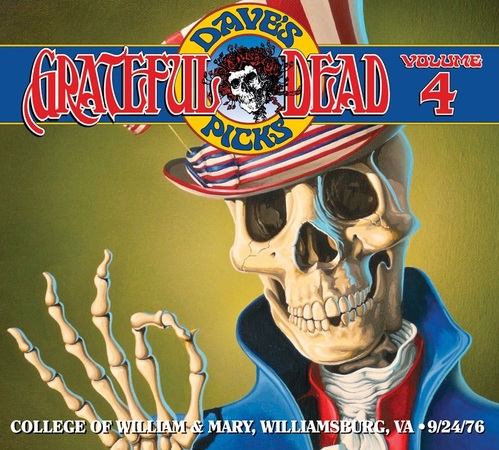 For their second visit to the venerable College of William & Mary, nestled in the colonial hamlet of Williamsburg, Virginia, the Dead puled out a pair of sets that turned wide-eyed freshmen into diehard devotees, and left local Dead Heads awed and amazed. Here was undeniable proof that the band was indeed back from their brief retirement, energized and at the peak of their powers. The stories of that show, bolstered only by a relatively primitive audience recording, made this one of the jewels in the band’s extended oral history. It was one of those shows whose power could really only be imagined, interpolated from the fervor and passion of those who were present--until now. He should know, as one of the lucky ones who saw the band perform on all three of their stops at the second-oldest college in the country. When the band first performed in the 10,000-seat William & Mary Hall, it was 1973, but to local Heads, it seemed like 1967, with only the first hints of the burgeoning counterculture shaking the trees of the beautiful wooded college grounds. Three years later, when the Dead returned, the ‘60s were in full sway, shaking the foundations of the campus itself. Ads for head shops boldly touted their wares in the pages of the student newspaper, and the news that the Dead were returning to reprise their legendary stop at the campus electrified tidewater Dead Heads. And now the band was determined to let the music drive the business. During the hiatus, various notions for how best to accomplish that had been bruited about. Ideas included a permanent Bay Area hall where the band could hold court without touring, as well as stealth, or “hit-and-run” shows, with no advance announcement. Both ideas would come to fruition eventually, with the “Formerly the Warlocks” shows taking place at the band’s next Virginia venue, Hampton, in 1989, and both Weir and Lesh opening venues in Marin County in 2012. But in 1976, the Dead needed to focus on rebuilding. There was much to rebuild. The year had begun withe the Bank of Boston calling in their loan to the band’s record company; when label president Ron Rakow left, along with the bulk of the advance from United Artists, Grateful Dead Records and Round Records were doomed. The release of Steal Your Face, the live double-LP set culled from badly flawed tapes of the band’s farewell shows at Winterland in 1974, didn’t help; panned by both critics and fans alike, it haunted the tour, but those who caught the band on a good night would have been hard pressed to connect it to the band on that album. Longtime fans understood, however: the Dead’s capacity for rebounding from adversity was one of their hallmarks, a quality highlighted in an extraordinary weeklong sting in San Francisco’s Orpheum Theater that summer, hailed by critics and ecstatically celebrated by Dead Heads as proof of the band’s return to form. It set the stage for a powerhouse fall tour, with a streamlined operation supported by a crew of only six, playing small halls, for the faithful. Musically, the tour marked the ongoing reintegration of Mickey Hart back into the ensemble, after several years away, along with changes in the band’s songbook. Several fine new songs debuted, notable the triumvirate “Help On The Way,” “Slipknot!.” and “Franklin’s Tower,” and “Cosmic Charlie” was retired, following a final airing the night after the stop in Williamsburg. Other absences haunted the tour, chief among them the tragic death of longtime roadie Rex Jackson, who died in a car accident on Labor Day weekend. His death was a tremendous blow to the band and extended family, prompting speculation that the tour would be cancelled, but the Dead followed through on their pledge to mount the “Dead Heads Only Tour,” as it was nicknamed using mail-order sales to ensure that fans had dibs on tickets. Indeed. Three weeks later, William & Mary fans remembered, and tickets were hard to come by. Fans drove in from as far away as Florida and New York, painting the campus in tie-dye. Students were used to costumes in Williamsburg, but not these. “I remember waking up the day of the show and all the tie-dye in the middle of Colonial Williamsburg was just surreal!” one student recalled. Fittingly, the best press of the tour appeared in the most unlikely of places: a few paragraphs on one of the shows, buried in a review of a Monty Python album. After noting that the Dead’s “collective stage presence was about on a par with that of a fifth grade drama group,” the reviewer goes on to describe a classic Dead concert moment: “Something unusual was taking place, one of those rare moments when everything begins to work, when the band’s disparate elements suddenly--after vainly trying for hours--fell into place and the music began to soar...each unexpected transition to another old hit rendering the crowd--which was by now up and dancing on the folding chairs--even more helplessly ecstatic. The band had taken a mob of tired, drunk, stoned, bored and listless people and turned them into a seething mass of benevolent hysteria. It was surprising, it was funny, it was exciting and it was the purest expression of what rock ‘n’ roll is supposed to be I’ve ever heard.” On September 24, 10,000 Dead Heads spilling out of William & Mary Hall would have agreed. The Dead played William & Mary one more time, in 1978. By then, the campus had hosted dozens of rock bands, but the Dead’s shows were the stuff of local legend. To fans, William & Mary Hall “just had this mystique: there was something happening there, and so people would come out of the woodwork” when a show was announced. On April 15, 1978, thousands of Virginia Dead Heads did, and were treated to a fine show. Fans were ecstatic; visitors there for Parents Weekend were not. That scheduling debacle may explain why the Dead were notably missing from the list of bands to play the Hall in that year’s yearbook, but over time, the band’s appearances would become a point of pride, and today, the Dead are the first of the major rock groups cited as having performed on campus. It is a fascinating example of how the band created pockets of followers across the country--especially in higher education. For Virginia Dead Heads, the shows at William & Mary cemented the Dead’s legend and gave them a piece of the phenomenon they could call their own. That local pride followed the band when they moved to Hampton Coliseum in 1979, where they woudl play a number of legendary shows over the next decade and deepen Virginia’s proud association with the band. Jerry was right: the Dead did earn “hard fans.” Shows like this remind us why. This album was released in November 2012.